In Roman mythology, the Roman goddess Abundantia was the personification of abundance. A cult in the form of temples or altars is not attested. However, she was frequently depicted on coins of the Roman Empire as a symbol of general prosperity, abundance of goods and their free availability. While she is wearing mostly a cornucopia showing valuable gifts which she pours out of her horn. Sometimes she keeps ears in the other hand. 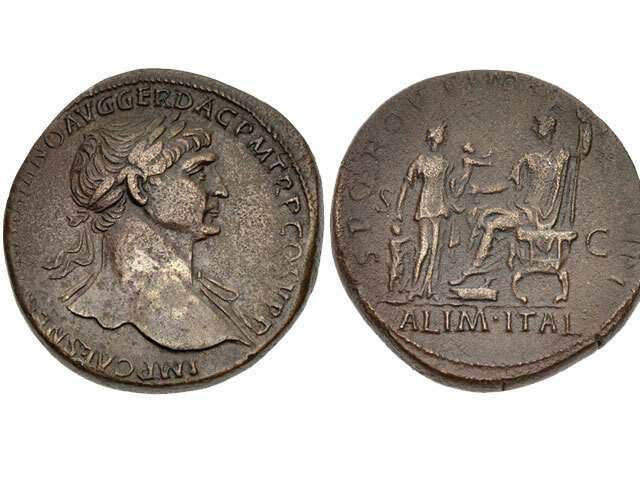 In just a few, late Roman coins, the Roman goddess Abundantia occurs also as image which scatters coins among the people. In Medieval mythology, Abundantia is still present. Now she is Lady Abundantia, in old French called Dame Habonde. According to this legend, Abundantia is a kind of being that brings prosperity and abundance, when she enjoys together with her night ladies food and drinks, which have ben offered to them at night. Abundantia is thus both a Roman and a Nordic goddess of prosperity, success and abundance. The legend says that she helps all who seek her help to gain gold and wealth. And Abundantia always carries a cornucopia full of gold coins, which she lets drop behind her on the way, where ever she goes. A sign for her assistance are coins found in the most amazing places. But Abundantia brings more than just pocket money! She also gives prosperity and abundance! On the right, Abundantia faces Emperor Traian. Abundantia did not need temples or altars, but the Roman goddess of prosperity and wealth was abundantly present on her own symbols – on coins. In her the difference between religion and mythology are blurred. While Abundantia is represented always as a beautiful woman, in one hand a cornucopia and in the other hand corn ears, she wears a wreath of flowers. On later Roman coinage Abundantia distributes coins among the people. According to the legend the Roman goddess visited the houses at night to bring prosperity to the people. Abundantia is a goddess who is especially kind to women, supports them and helps them to achieve and maintain leadership for inner wealth. Yet, she also looks after financial institutes. Warsaw has set her a monument in the famous Wilanów Palace Road. She holds a cornucopia as a symbol of abundance, food, and good harvest.